In U.S. law, fatherhood outside of marriage implies the obligation to make substantial, recurring payments to the mother (“child support”). These payments are based on the father’s income, not the child’s need. Unmarried fathers’ obligation to pay money to mothers hasn’t been associated with the father receiving any custody rights. In 1877, the Supreme Court of Minnesota in Olson v. Johnson made clear that unmarried fathers essentially have the legal status of wallets. Olson fulfilled these legal obligations of fathers as wallets. This court’s judgment wasn’t aberrational. Child custody decisions in Britain and the U.S. have for centuries been justified on the basis of “the best interests of the child.” That abstract justification has enabled family law in action to be based on deeply entrenched gender stereotypes. A fundamental gender stereotype is that, compared to women, men are less important to children’s lives. Family law is profoundly biased against men. A thinker who has extensively studied Massachusetts family courts has suggested, with detailed analysis, that men are better off not presenting their side to family court. That’s a travesty of justice. Marriage equality should extend to gender equality under family law. 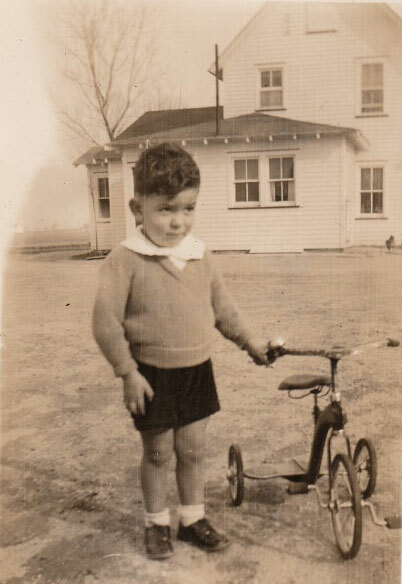 If that can’t be recognized as a matter of justice, it should at least be recognized as vital to men’s incentives and the long-run economic future of the U.S.
[image] Boy with bike in southern New Jersey in 1937. Photo courtesy of Elmer Galbi. Why is there no way to e-mail this? This freely available work doesn’t currently support an email-post button. So you have to copy and paste the link. I regret this burden for you. Just as soon as I receive adequate compensation for all the work I’ve freely shared, I’ll look into implementing one.